About a month ago, Upton’s Naturals sent me some free product coupons in exchange for honest reviews and developing a few recipes. I, of course accepted, enjoying the chance to try a new vegan product. And recipes – I love to cook! – how hard could coming up with a few recipes be? 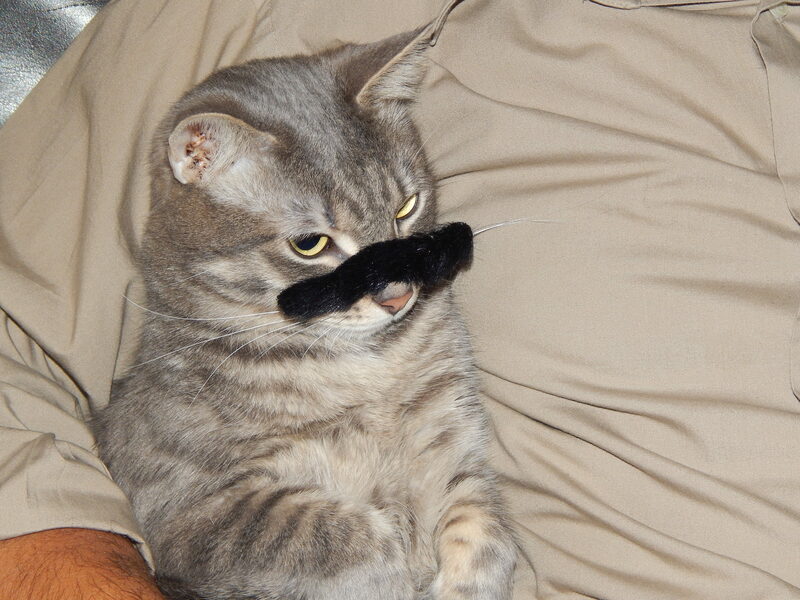 Ok, I know mustaches are generally grown UNDER your nose but … Tigger Tiger seemed to have an odd hair growth after sampling all the Upton’s Naturals products! The experiment turned out to be a rather interesting and creative challenge, as I am really more of a “beans and greens” kind of gal. Coming up with “meat” based recipes was harder than I expected! However, it was also fun to experiment and search back through my memories. I was able to create some very good vegan versions of comfort foods from my past. 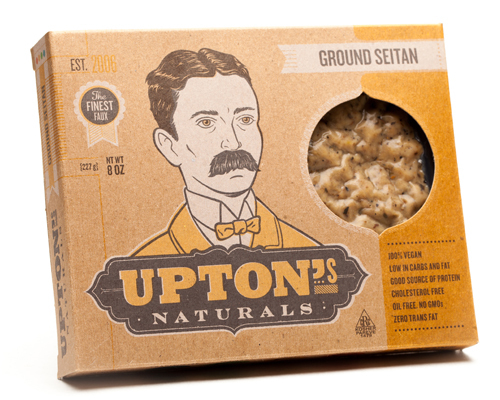 Following are my overall thoughts on Upton’s Naturals, my honest evaluation of their products, and the recipes I created. One of the things I liked most about Upton’s is their short and recognizable ingredients list. 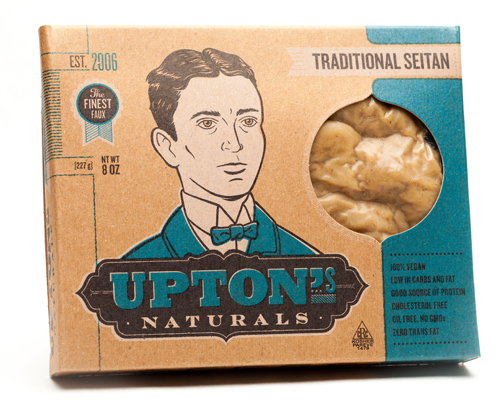 For example, Upton’s Traditional Seitan contains Water, Vital Wheat Gluten, Soy Sauce (water, wheat, soybeans, salt), Whole Wheat Flour, Garlic, Sea Salt, and Onion. No artificial colorings, flavorings, preservatives. 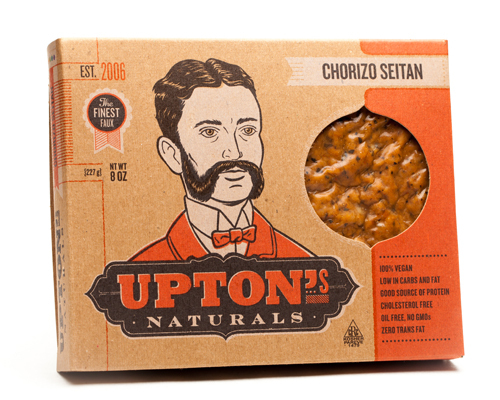 Be aware that Upton’s products are made from seitan (wheat protein), so they are not suitable for those on gluten-free diets. However, Upton’s does not contain soy protein – only a little soy sauce – which could make this a good alternative for those vegans trying to reduce the soy in their diets. 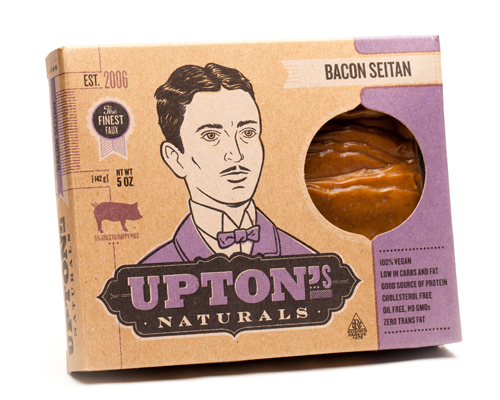 Where can you find Upton’s Naturals in Charlotte? Currently, in Charlotte, NC, you can find all 5 Upton’s Naturals products at the Ballantyne Earthfare. The SouthPark EarthFare carries the Traditional Seitan and the Italian Seitan. I’ve also heard rumors you can purchase these at Healthy Home Market, but I’ve not personally verified this yet. This was my favorite of the five! Browned, the crumbles tasted like Italian sausage – perfect for topping a pizza. Browned and added to my mother’s trademark spaghetti recipe – this was phenomenal! The texture changed with simmering – became chewy yet juicy – would fool most omnivores. Would definitely recommend for adding to pasta sauces and veggie lasagnas. (It’s rather strongly seasoned, so choose mild sauces.) Might make an interesting protein addition to minestrone soup, as well. 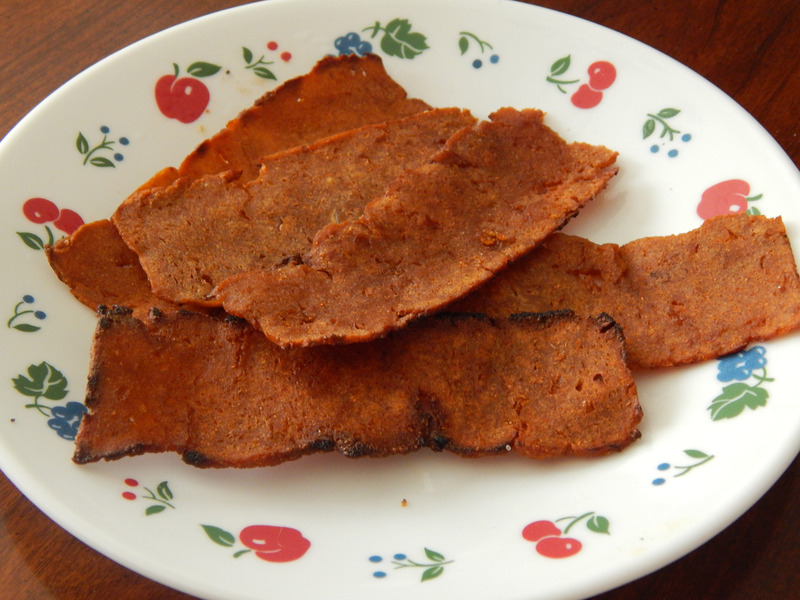 These are larger chunks of seitan. Would be perfect in stews or vegetable “beef” soup. I recreated a favorite omnivore comfort food from my childhood – the Philly Cheesesteak Sandwiches my dad and I enjoyed together so often. Peppers, mushrooms, onions, and seitan sauteed and then baked in a sandwich with Vegenaise “cheese.” Ohh … my … goodness. (I did, however, cut the seitan up into smaller pieces with kitchen shears). It doesn’t look like real bacon, but the taste and texture are incredible! The best vegan version of bacon yet – without all the artificial gunk you find in their competitors’ products (hellooo, MorningStar Farms!) It does come with a small learning curve – fry a slice too long and it will burn; not long enough and it will remain chewy and flexible and not really very bacon-y. Fear not, I got the hang of it on the third slice! It doesn’t look much like bacon but the taste and texture is incredible! I confess – I did not come up with a recipe for this one. Just fry a few slices and eat them for breakfast. Or on a tomato sandwich. By the time I tested this one, I was “getting the hang” of seitan. Sauces, stewing, and simmering work really well with these products, giving their chewiness a very realistic meat-like texture. So I decided to make a decadent – and delicious – vegan beef stroganoff. What else would I use this in? Chili, vegetable “beef” soup … anything that you simmer or stew. This is ground seitan, just with Chorizo flavor! I liked that the Chorizo seasoning was not so strong I would have to alter any of my recipes. 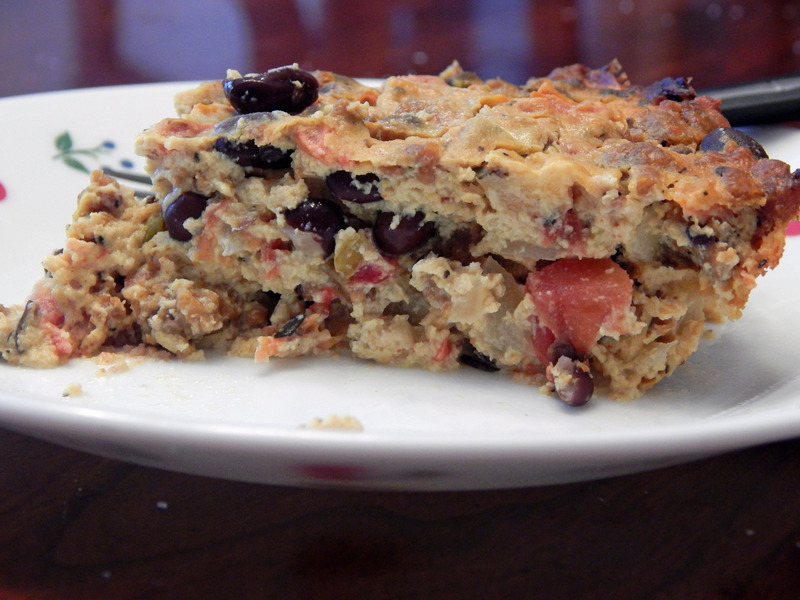 I used it to make an really awesome vegan Southwestern Quiche. What else could you use it in? Lightly browned, it has such a sausage-like texture I’d suggest tofu scrambles. Thanks for turning me on to this product. II tried the bacon this morning and even tried it out on my mother who is very picky. We both loved it. Both of us much watch our sodium content also, Even though it contained more sodium than I would like, it didn’t tasted salty. Good flavor and texture. These are also available at the Earthfare in Huntersville. I have an update for the Huntersville store, They no longer are carrying the Upton’s Naturals line. Thanks for the update, Mavis!